In the tradition of The Orchid Thief by Susan Orlean comes Winged Obsession—a gripping, real-life thriller that exposes the seedy underbelly of illegal butterfly trading. An acclaimed mystery writer and respected journalist specializing in wildlife issues, author Jessica Speart tells an extraordinary but true tale of greed, obsession, and sexual temptation, masterfully chronicling the downfall of the “Indiana Jones of insects” through the determined efforts of a rookie Fish and Wildlife agent who put his life on the line to stop him. A freelance journalist specializing in wildlife enforcement issues, Jessica Speart has been published in the New York Times Sunday Magazine, OMNI, Travel & Leisure, Audubon, and many other publications. She is the author of several mysteries and lives in Connecticut. 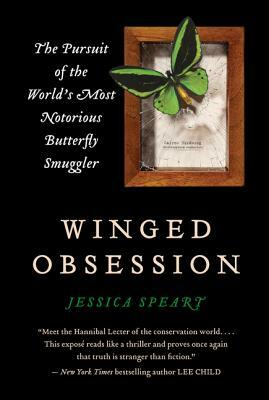 Winged Obsession offers a fascinating glimpse into the illegal market in exotic and endangered butterflies....By the end of Winged Obsession, I was rooting for creatures I didn’t know existed before I read the book. Butterfly smugglers? Who knew? Journalist Jessica Speart chases down the butterfly world’s most elusive criminal, the notorious Yoshi Kojima, in her fantastic new book. It’s a journey with the twists and turns of a taut thriller — like The Orchid Thief, only with wings. Meet the Hannibal Lecter of the conservation world... this expose reads like a thriller and proves once again that truth is stranger than fiction. Winged Obsession is an unputdownable thriller.... I loved this book!